I have a few tidbits I'd like to share with you today beginning with upcoming engagements. Next Wednesday, October 10, the Cambridges have four engagements in their diary beginning with a visit to Newcastle Civic Centre in Newcastle upon Tyne where they will meet representatives from local projects involved with the Olympics, representatives from the Institute For Ageing and Health and students from the Percy Hedley School, a school that provides services for disabled people. 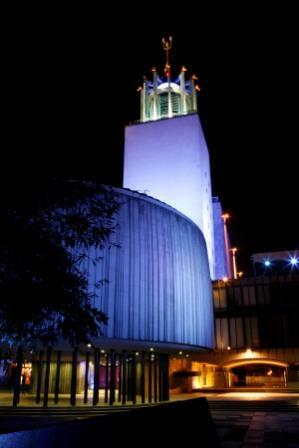 A look at the Newcastle Civic Centre. The couple will then travel to Elswick Park to meet groups involved with the Queen Elizabeth II Fields in Trust Challenge. 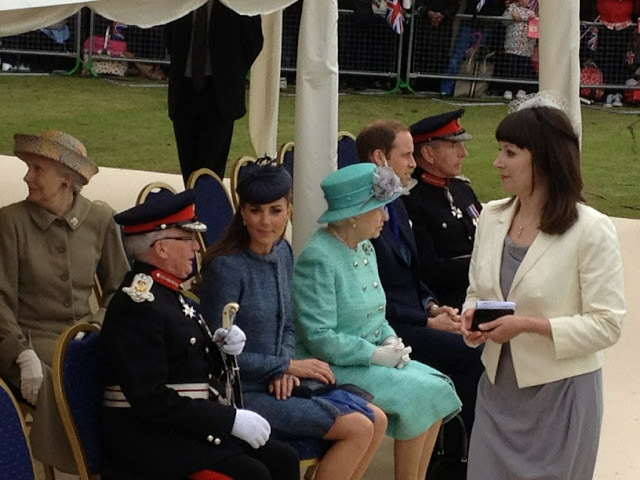 William and Kate attended a Fields in Trust event in June with the Queen in Nottingham. It is interesting to see the couple following up on the progress of the trust. Next up, the couple will visit Keyfund, a youth charity in Gateshead before their final engagement of the day, a visit to CRI Stockton Recovery Service. The Duke and Duchess will meet families who are involved with Action on Addiction's M-PACT (Moving Parents and Children Together) programme. Action on Addiction is one of Kate's patronages and no doubt Kate will be eager to learn more about work with children living with parental substance misuse and addiction. Kate wore a Beulah London dress to last year's 100 Women in Hedge Funds dinner. Kate graces the cover of Hello! Magazine this week. Thanks you Charlotte for this great update. You are always on the ball bring us fans up to date with all their schedules. I do have to say I am very disappointed to hear that the Duchess will not be by her Prince's side for his engagement. She is almost always with him during his engagements. I am going ot miss them together and all the loving eye contact they have between them. Do you know what is keeping her from being with him? Thank you for your lovely comment Pauline. The Palace said Kate has a 'private prior commitment'. It would have been great to see them together! Oh dear, do u think recent events have taken their toll on the duchess and that she is shy like was posted In a previous post? The hedge fund event sounds dull. I would have a prior engagement too. I'm glad to read about Wills and Kate's new engagments. I simply cannot wait to see them together again! Thank you so much dear Charlotte for this great update! I hope when Wiliam meets those Olympic volunteers next week that one of them asks why he snubbed the Paralympics to go on holiday when he was supposed to be an Ambassador for BOTH! I read somewhere that Will and Kate will be attending the royal wedding in Luxembourg later this month. Have you heard anything about that? I'm afraid not, the Palace confirmed they would not be attending. Thank you so much for uploading the videos!!! I really enjoyed them! One gains so much more perspective through the videos. The HRH's have SO MUCH RHYTHM...those two can seriously dance with grace, sensuality and great moves (and that was their 'polite in public' performance)! So much for the stereotype of the stiff legged British. Thank you for including the You Tube videos. It was a lovely overview of the South Seas Tour and served to put the awful photo invasion in the proper perspective. Thank you for your dignified coverage of the Royal couple. Thank you so much Charlotte for posting the links to the videos!! !Any predictions about what she will wear for the event? Is anyone else annoyed they have scheduled to "work" for one day this month? I suppose it's possible they will schedule one or two more, but geesh that must be nice. William is working full time for search and rescue. Kate works at home plus all her regular charity stuff. W and K do this kind of stuff out of sense of responsibility, no pay. I don't get what your point is. @ Anonymous 3:29 I don't understand how you can say they are only do one engagement this month. I guess you can't read. The Duchess & her Prince will be doing to together and William will being doing on his own. Then the Duchess and a private engagement the same eveing as of William, that is why she will not be with him. I guess you also don't know that they are not full time working royals. William is a full time RAF pilot and the Duchess's main job is to be a military wife at this moment. Plus doing her charities work. And they also just returned from a 9 day royal tour on behalf of the Queen to Asia. That is hard work if you don't know. So they rested for a few days then William returned to his duties at his RAF base and the Duchess went back to being his wife. So inless you are in their shoes I wouldn't be making the comments you have. And if you don't like it then why not write to the Palace and tell them you think the Duchess & her Prince need to be doing more engagements and charity work. Ok. I'll amend my comment. Kate is working one day (several engagements in that day, but one). I'm not trying to stir anything up, but one day of public events is disappointing. I know plenty of military wives that take on more than housework and a day of volunteering a month. @ Pauline - I'm a different Anonymous, but I feel like I need to stand up for my fellow nameless commenter and tell you that your remark, "I guess you can't read," was unnecessarily hostile and offensive. Why can't you just address the comment's substance, minus the hostility and personal attacks when someone says something with which you disagree? The reality is, Kate is a very privileged member of the royal family and the reason we are even able to keep having this debate about her work activities is that there is no real job description for being a duchess. Surely there is precedent, with the Princess Royal and of course the Queen being exemplary hardworking royals, but there is no set requirements and responsibilities besides the fact that she needs to produce an heir. So this debate will always just be a subjective opinion about Kate, which is fine, but ultimately unresolvable. Yes, you are right, Kate is not working full-time like most of us, but isn't it exactly that what fascinates us so much about her life - that it is NOT like our average lives (even if I must say that I enjoy my everyday life very much)? Kate is neither a doctor nor a teacher, she does not drive a bus or taxi, she will never ever serve a coffee or whatever you and me call proper work. Kate was born into a rich family, good luck for her, so there has never been the urge to earn her own money. I wish my parents were rich, too, and perhaps my two children would like to have rich parents as well. But this is not the case, so let’s go out to work. Kate is married to a prince, my husband is as wonderful as William, or even more ;-), but unfortunately he is not a prince. So, what does that mean? I want to express that my life is totally different from Kate’s. I am absolutely happy, but I don’t have many opportunities to wear a gown or a tiara, but I would like to. So I take a look at Kate’s life, because she lives like a fairytale-princess, she is beautiful and wears clothes that I can only dream of. Besides she married the love of her life, who is a millionaire. Come on, do you really expect her to work every day? This is not her job and it will never be. She is NOT like us, so she does NOT have to work like us. She lives another life and that makes it so interesting for me to follow her. Well said anonymous 2.38 re Pauline's rude and hostile remarks when someone disagrees with her opinion. We r all entitled to an opinion and I like reading the various ones here. I totally agree with you Marion, that's what's fun about following Kate!! I am sorry if you think my comments are rude. But the person who is putting the Duchcess down for only 1 or 2 engagements don't understand that her life really is not her own anymore. She goes and does what the palace tells her to do. We really don't know what it is like because we don't and will never walk in her shoes. So really what I want to say is don't put her down because what she does not do. We also have to remember neither her or William are full time working royals. Her main job is to be a wife to William and hoppefully have a heir soon. I'm the original Anonymous from this little exchange and I just wanted to apologize quickly if I offended anyone. My intention was not to put Kate or the monarchy down, merely point out that after the tour where we got to see her a lot- this month was disappointing. I'm aware that she is not a full time working royal and that she has had to make a lot of personal sacrifices to marry the man she loves. I'm enamored by all things Kate and I think my sarcasm may have tainted that. I'm sorry if anyone felt I was passing judgement on a world I clearly know nothing about. @Anonymous 13:57 I understand how it is that when we write a comment it can get out of hand. And if I have wriiten comments that were aggressive, I am very sorry. I do not mean any disrepect to any one who visits this great blog Chrolette works so hard on to keep us fans up to date on the Duchess and her Prince. But I have to say I do get up set when people put down the Duchess because they don't understand how this whole royal family thing works. so instead of doing a little reading they just write nasty thing about her which again I don't think is right. And as far as not seeing much of the Duchess after this tour, remember when they went to Canada, they went under the rader. It was like weeks before we seen the Duchess and her Prince. I think becuase these tours are so short and they cover alot of ground, they need to take some down time just to rest. And then William had to return to his duties as an RAF pilot. And it was a 10 hour flight back to the UK for them. I have to admit that I sort of agree with anonymous about the Paralympics. I was very surprised and disappointed to see pictures of their French holiday (not the Closer ones) when they were supposed to be Ambasadors for the Paralympics as well. They didn't even go and met the athletes like with the Olympics. As an athlete, I would've felt very disappointed. Don't get me wrong, I love them to bits and I think they're GREAT, but when you have a job to do, you do it well. Work hard now, play hard later. We've all had at one point in our lives worked or studied overtime, for days on end only to have a break a year or months later. Anyway, that being said, it would've been nice to see Kate in an evening gown, but we also know that she does a lot of 'behind the scenes' visits to her charities which I believe is very good. Maybe it's that. 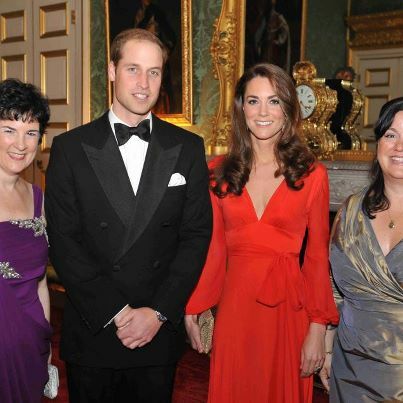 Thanx Charlotte, you do a great job and I love Will and Kate. She does not do private visits. If she did the master manipulators at the palace would be letting us know! The Duchess has made private visits to her charities when she was deciding which ones to support. That is from the Palace. And she does make private visits to the scouts in Wales that we don;t hear about either. And thank you for the videos! It was very interesting to see the other sides. The stories behind the persons, the place etc. And of course to see the big media attetion for the couple (sooo many photographers-wow) and their endurance; always beeing nice to the people, smiling. I'm so impress that Kate was so professional. Keep on ding her job...wow!! They are an awesome couple! Thanks Charlotte for posting these wonderful updates! Charlotte- I just tried to view the videos you have posted above on their tour and they have been removed by YouTube. It says something to the fact that they were used with out permission so they removed them. Maybe you can check and see what is going on with them. I really wanted to see them. And I can't wait until Tuesday when they have their first engagement since the great tour. Have you heard anything more on the Duchess's engagement on Monday? Or is it still maybe just a private one? Any way thats again for all your hard work on the blog.